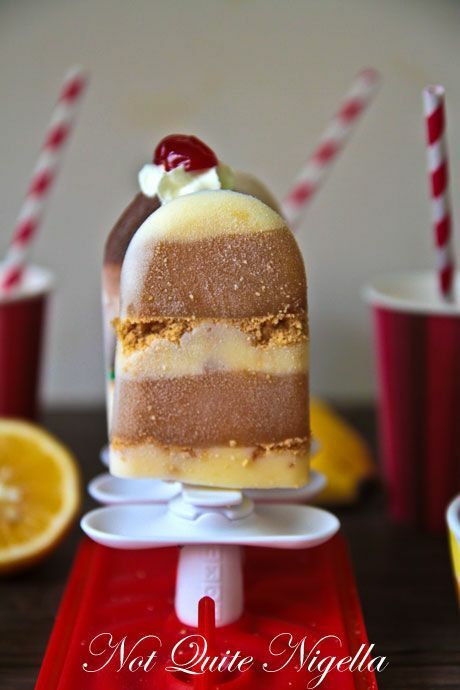 A Kaleidoscope of Summer Ice Pops! "I think you'd make a ...good mother" a friend said to me once. I looked at her. Who was she kidding? Me? "No no no. I'd be a terrible one. I'd indulge them with anything they wanted, cook them up cakes and cookies on a whim and feed them ice creams if they looked even slightly flushed. And I'm secretly thinking that I'd inadvertently end up raising a creature like Courtney Stodden. And then she'd end up marrying a 49 year old guy when she was 16..." I said stopping when I realised that I had actually turned the conversation decidedly weird. "Ummm ok, we don't need another one. You can stay as a godmother then" she said rethinking her comment. I realised the truth to these words when I plied Mr NQN with as many icy pops as he could eat and then offered him more. 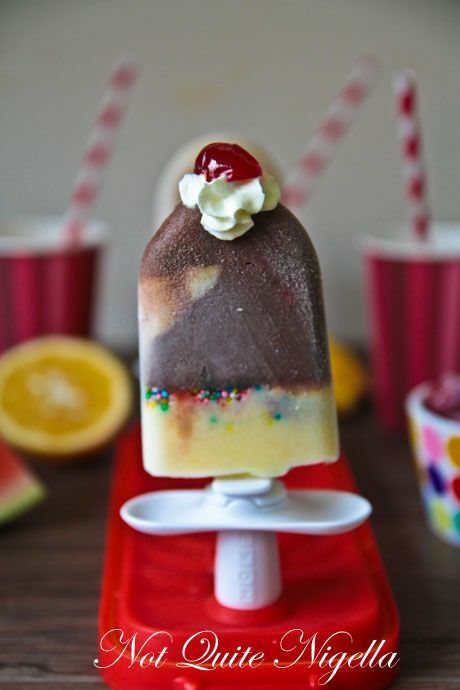 But before you call social services for force feeding and husband abuse, the pops were home made and made with lower fat ingredients and contained less sugar than than what you would buy. The warm weather played a hand in this proliferation of icy treats. 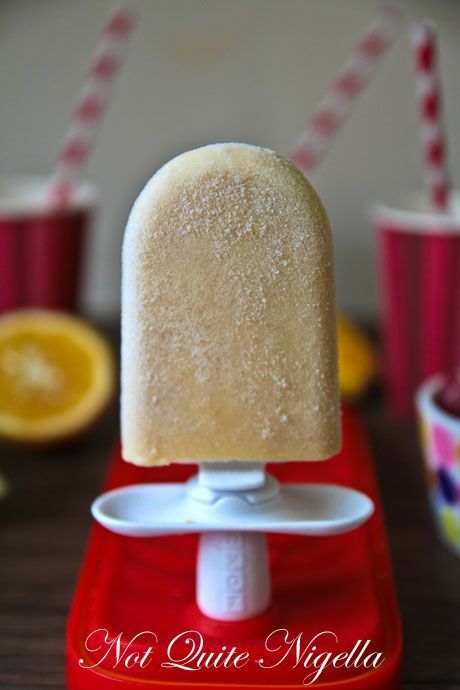 Recently though, the weather has been pretty unSummery to say the least and when I first made these, it was in October when the Summer weather really hit us and on these hot days all I wanted to eat was icy pops. 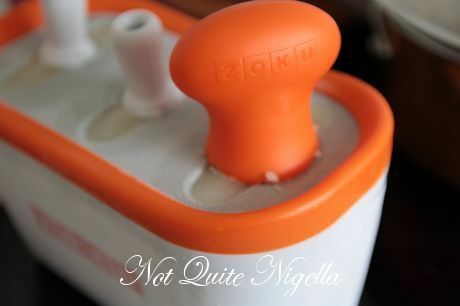 To aid in this venture I was sent a Zoku machine which makes pops in about 10 minutes (review is below). My favourite one for sheer accuracy was the apple pie pop which was just like an apple pie in icy pop form followed by the banana custard pop which was creamy and sweet with caramelised brown sugar bananas and sweet vanilla custard. 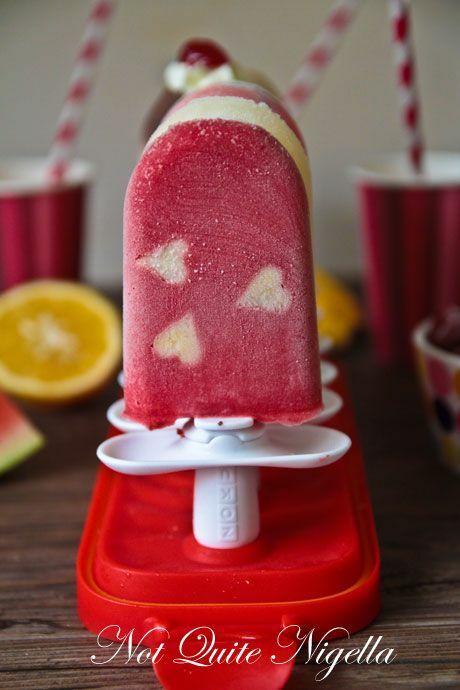 Most of these recipes will work in a regular popsicle mold and not just a Zoku although some of the effects like the watermelon pips, hearts and lemon slices won't come into as dramatic an effect on a regular popsicle although you could add these little bits on later. I've shown the recipes from easiest to most difficult although the most difficult is really just the one that takes the longest and requires the most patience. 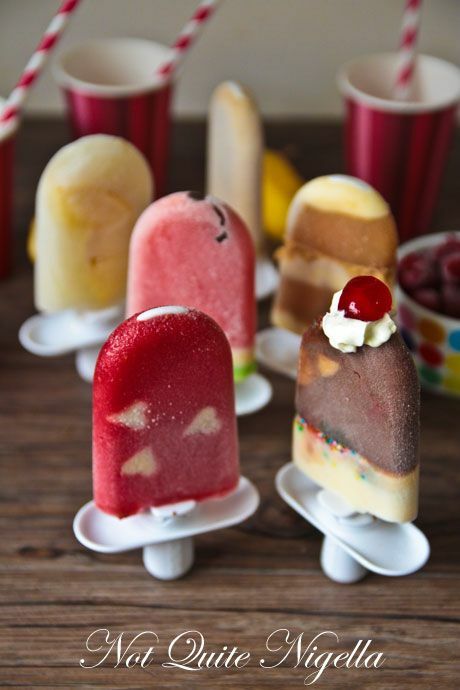 I found this range of ice pops covers those that love fruity, fresh flavours through to those that like a bit of indulgence to those that want an ice pops, like life, with whipped cream and a cherry on top. Moi? Who me? Yes ok that would be me! So tell me Dear Reader, are you a feeder? Or an eater? Or both? Step 1 - Stir together all of the ingredients until the sugar is dissolved. 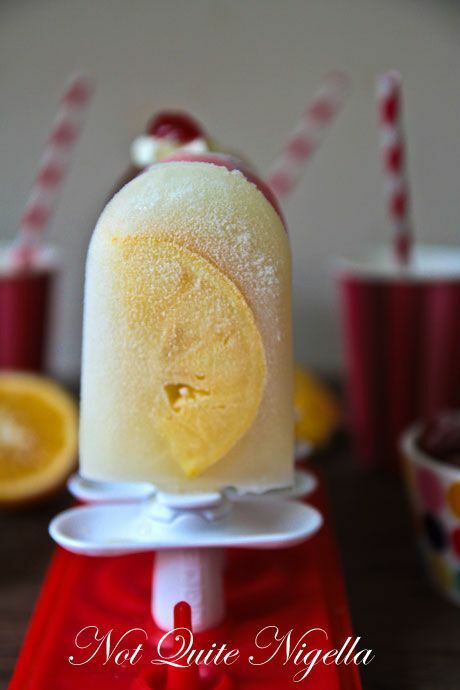 Using the Zoku fruit wand or tweezers, apply the lemon slices to the walls of the pop molds-they will easily stick. Pour the lemon mixture until the fill line and freeze until set. 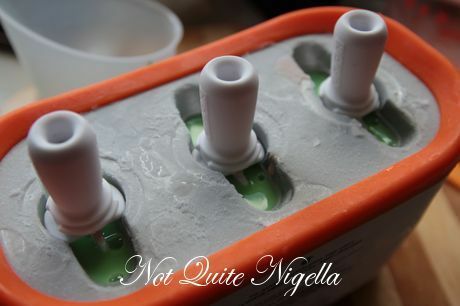 If using a popsicle mold dislodge by running hot water over the mold. If using a Zoku remove by screwing the super tool into the top of the stick and pulling hard. Step 1 - Prepare the banana filling ahead of time to allow to cool. 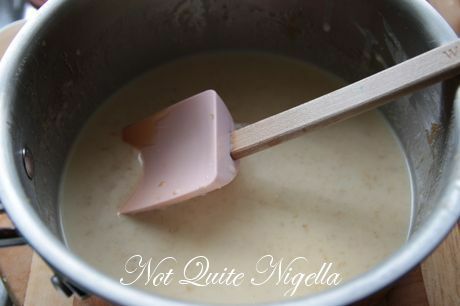 In a saucepan melt butter and brown sugar over low heat until it starts to thicken. Cut the banana into 1 inch pieces and add to skillet and stir to coat. 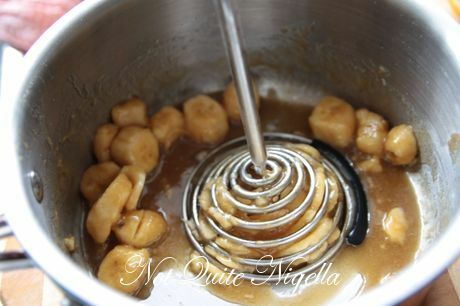 Remove from heat and mash the incorporate the banana and sauce. Whisk in the milk, custard and honey and add cinnamon and chill completely. 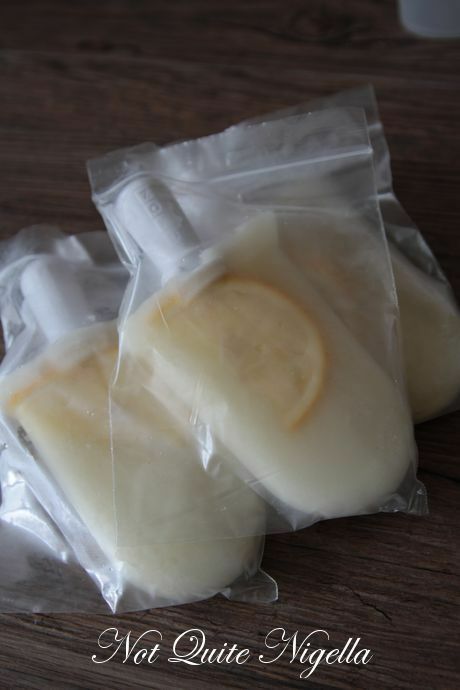 Step 2 - Insert sticks into the Zoku machine or fill popsicle molds with the chilled banana mixture and freeze until hard. 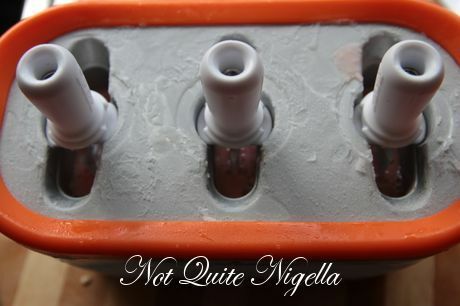 If using a popsicle mold dislodge by running hot water over the mold. If using a Zoku remove by screwing the super tool into the top of the stick and pulling hard. Step 1 - Make watermelon layer. Blend the watermelon in a food processor and sieve to get the juice out (press against the sieve with a spoon to help it come out). Mix the watermelon juice with the remaining ingredients in a jug or a Zoku jug. Step 2 - In another jug mix the remaining ingredients except for the green colouring. Divide this liquid in half,colouring one half green and leaving the other half white. Step 3 - Insert 3 chocolate chips into the sides of the Zoku pop mold - despite what the recipe said, my chocolate chips didn't really stick to the sides and fell down into the bottom if you are using a regular popsicle mold your chips will do the same. Pour the watermelon mixture into the pop mold stopping at about 2cms below the fill line. Freeze completely. 4 Using the white mixture, pour a thin layer of the white mixture and allow to set completely. Then add the green mixture and freeze completely. 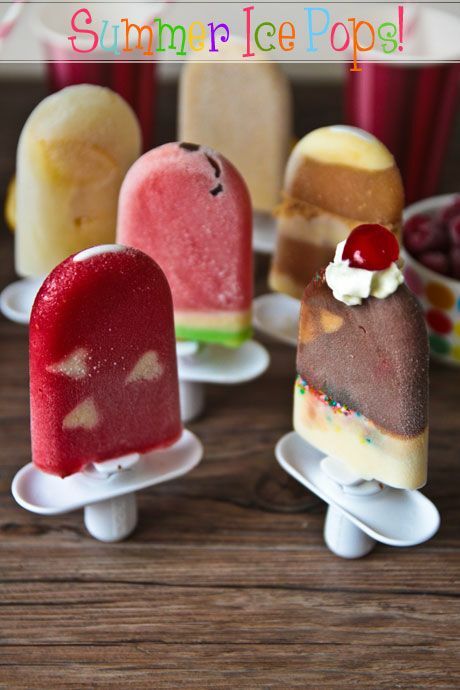 If using a popsicle mold dislodge by running hot water over the mold. If using a Zoku remove by screwing the super tool into the top of the stick and pulling hard. Step 1 - In a small food processor, blend the berries, apple juice and syrup-you can strain this through a fine sieve to get rid of the pips but I left them in. 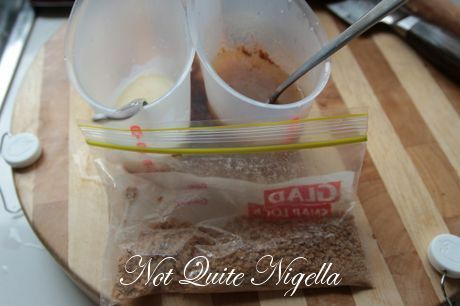 Make sure that this is quite liquid and not frozen to make it easier to pour. Step 2 - Using the small Zoku heart cutter cut out as many apple hearts as you can-I used about 6 on each pop and the more you use the nicer it looks really. Using the wand tool press the fruit against the frozen side of the Zoku walls-the fruit will stick easily especially if it is thinly sliced. 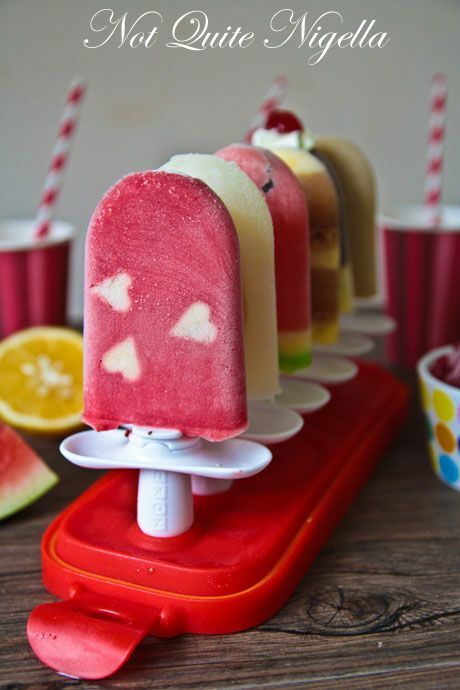 If you are using a regular popsicle mold your hearts will not stick to the sides. Pour the berry mixture into the mold and allow to freeze solid. 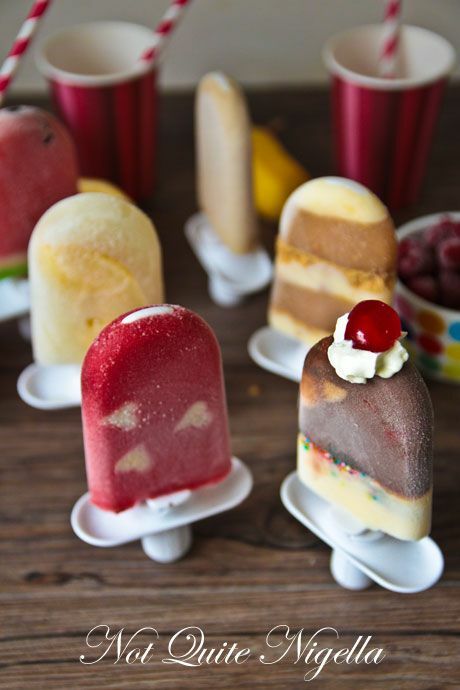 If using a popsicle mold dislodge by running hot water over the mold. If using a Zoku remove by screwing the super tool into the top of the stick and pulling hard. Step 1 - Make the apple layer by mixing all of the ingredients together in a jug or one of the Zoku containers if using. Do the same to make the vanilla layer. Step 2 - Insert pops into the molds and pour a little of the vanilla layer in first (about 2 teaspoon's worth). 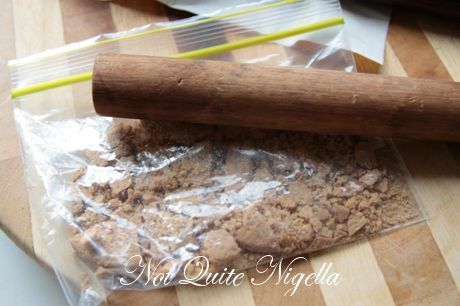 Freeze completely and the add the crumbled cookie crumbs packing down with the blunt end of a chopstick. Pour some apple layer, freeze completely and then alternate until you end on an apple or vanilla layer (not a cookie crumb layer as it is not stable). 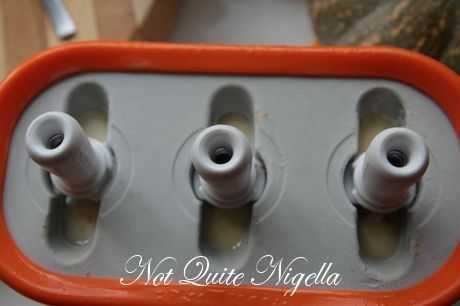 If using a popsicle mold dislodge by running hot water over the mold. 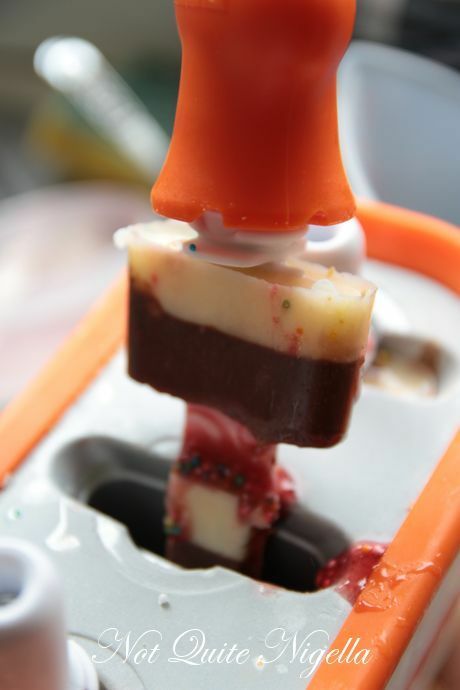 If using a Zoku remove by screwing the super tool into the top of the stick and pulling hard. Step 1 - Make the fudge base by melting all ingredient in a saucepan over low heat until the chocolate and sugar are melted-do not boil. Allow to cool. Step 2 - Make the vanilla layer by mixing all of the ingredients together in a jug or one of the Zoku containers if using. 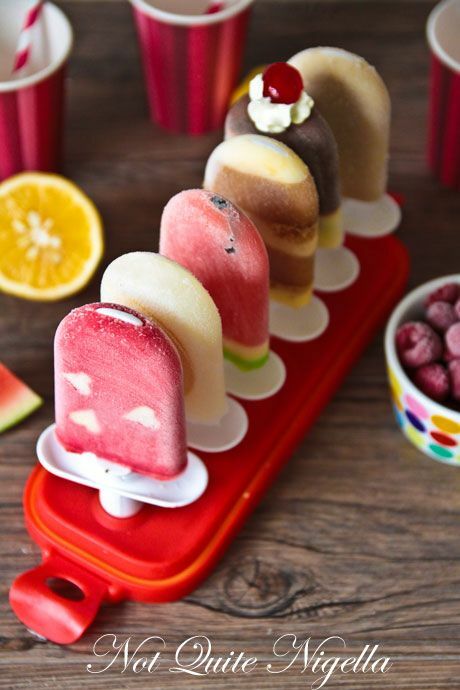 If using a popsicle mold dislodge by running hot water over the mold. If using a Zoku remove by screwing the super tool into the top of the stick and pulling hard. Step 1 - Dissolve sugar with water on low heat and then once dissolved, turn up the heat to medium heat and then boil for about 5 minutes until syrupy. Cool and it is then ready. Even though my con list is actually longer than my pro list I had to say that I really had fun using this product and if I had children (and I have a giant sized child in Mr NQN who once ate 16 ice creams according to his mum) I would covet this product. 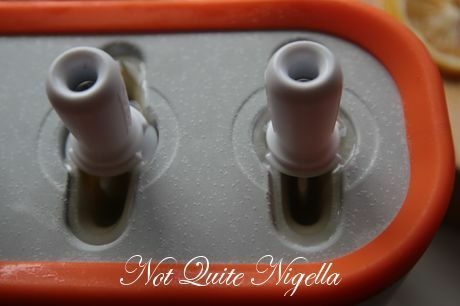 And Mr NQN loves that I have the Zoku and on the first night of sampling he ate six pops after dinner. You could of course do all of these recipes without a Zoku but it does take more time freezing and setting especially of the layered pops but it's not insurmountable. 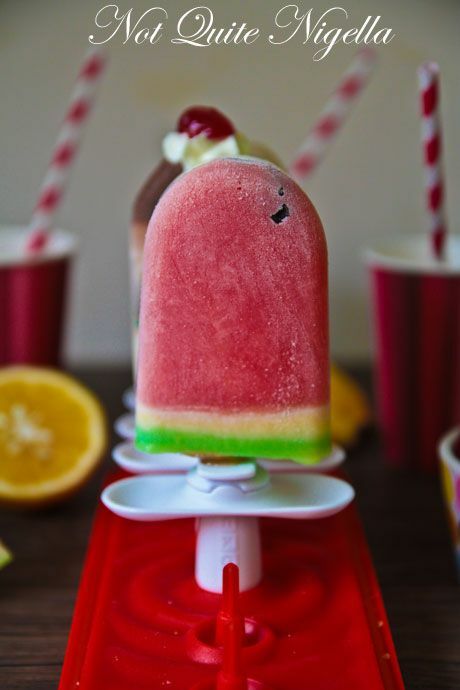 One of the recipes that I tried (watermelon pop) looked great until I added the yogurt which took away the refreshing quality of watermelon but also the trademark watermelon colour and made it look milky and light pink-it looks like a recipe error. Also the chocolate chips did not adhere to the sides as they suggested. One item that wasn't mentioned that you should not use is syrups in a layered pops as syrups do not set. Perhaps obvious to them but it wasn't to me :) (See pic below). featureMartini Gelato - Mr NQN cooks! feature Martini Gelato - Mr NQN cooks!